A chunk of tasty smoked cheddar cheese doesn't last long around my house. Cheese is great as it is, but when it's enhanced with a bit of smoke flavor it becomes pretty much irresistible! 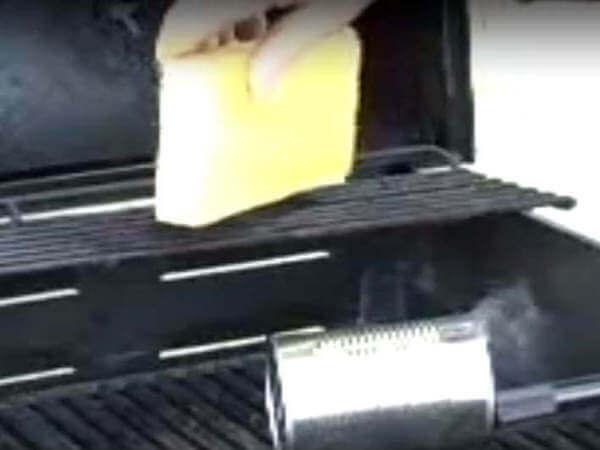 It's not possible to smoke cheese in a smoker that's set up in its normal configuration. It requires low temperature smoke to properly flavor the cheese without changing its texture. A couple of cold smoking methods are described further down on this page. The choice of cheese for my recipe is a locally produced cheddar cheese made from hormone-free milk. 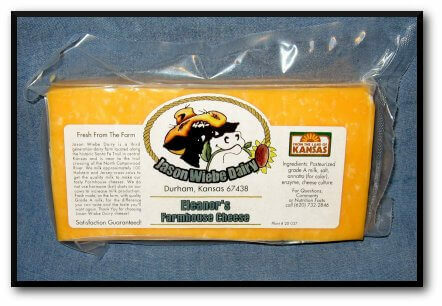 The Jason Wiebe farm produces award winning cheese on-site at their Kansas farm. Dairy cows on the Wiebe farm produce the milk that the cheese is made from. That's why the cheese is so darned good! How to Make Smoked Cheddar Cheese That Tastes Great! The smoker temperature has to remain under 90 degrees Fahrenheit for the duration of the smoking process. There are a couple of ways to do this. One way is to use a large cardboard box as the primary smoke chamber, heating the wood on an electric hotplate. Flexible aluminum clothes dryer vent ducting is used to route the smoke from the box to the smoker or grill. It takes a little bit of figuring out and a little duct tape, but it can be done successfully. An easier method of cold smoking requires that you have an empty tin can, a new soldering iron and a few smoker pellets. Pellets are placed in the can, the soldering iron is inserted then plugged in. See how it works in the following video presentation. I placed about one-half cup of apple wood pellets in the can, and it produced smoke for a half hour. There were unburned pellets remaining, so it could have gone longer. The temperature inside the grill went from 35 degrees Fahrenheit (the outdoor temperature) up to about 60 degrees after one-half hour, which is perfect for cold smoking. I put the tarp over the grill to help keep the smoke in, since it was a windy day. After one-half to one hour of cold smoking, wrap the cheese tightly in plastic wrap and refrigerate for several days. The longer the cheese remains wrapped after it's smoked, the deeper the smoky flavor will be absorbed.